Phelix is a new audio-matching program that identifies duplicate and similar-sounding songs by listening to songs with a selected folders and comparing the audio. 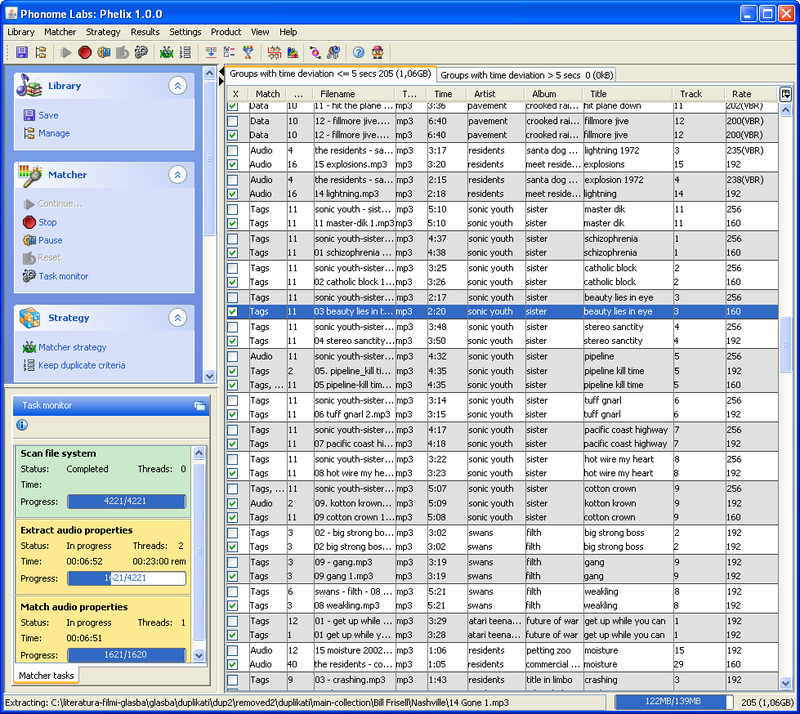 The application: Phelix's primary application is to free up computer memory being wasted on duplicate files without being limited to data- or name-recognition programs. The limitations of those programs are this. Data cataloguing programs are prone to interpretive errors; one artist may have many files data catalogued as identical. Name cataloguing will recognize files as being identical regardless of studio vs. remix vs. live differences. Phelix finds identical songs by "listening" to the sounds in the selected folder. Once a folder has been completely sound-catalogued, the user has the option of removing duplicates. By listening to the songs, Phelix also makes a separately compared table of similar-sounding music files. The uses of this near-match function are only limited by the user's imagination. In addition to audio matcher Phelix also match ordinary properties, like tags, paths and data. Ordinary matcher has long tradition: is proven, fast, intelligent and with many options. The name: Phelix is a new word combining phonos (ancient Greek for sound) with helix (the shape of DNA). Just as the Genome Project endeavors to isolate and catalogue the different properties of the genetic make-up of human beings, Phonome Labs has created an application for measuring and cataloguing the sonic code of your music folders. The user: The Phelix user is a serious music collector with an extensive audio library. The Phelix user is concerned with maximizing the integrity of his music folder and the operation of his computer. Laptop DJs and composers will love the freedom Phelix gives them by eliminating redundancies, whereas catalog purists will love the intense attention the application gives to identifying similarities in their music folder.